April | 2011 | 50 Westerns From The 50s. 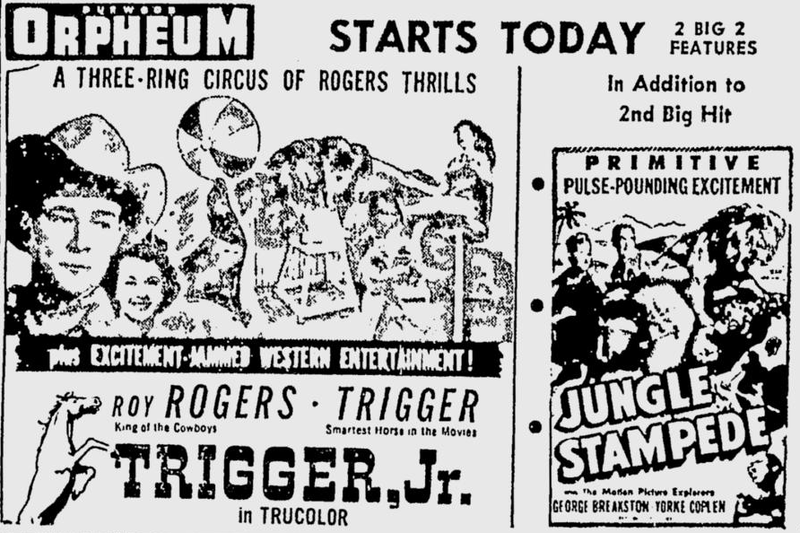 Maybe you missed it at the Orpheum back in September of 1950, but you can see Trigger, Jr. this Sunday as part of the TCM Film Festival’s tribute to Roy Rogers. He’d be 100 this year. 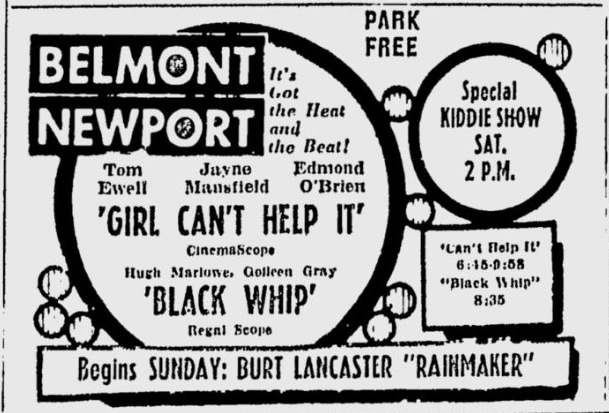 The chance to see this uncut, and in Trucolor, on the big screen is every bit the “Excitement-Jammed Western Entertainment” this ad promised. I urge all you West Coast folks to make it out for this one — and have a box of Raisinets for me! 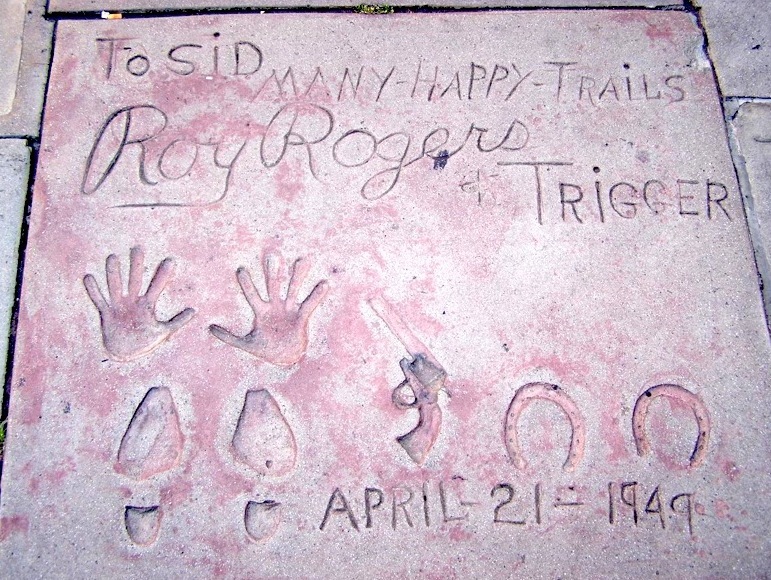 By the way, you can see the just-as-wonderful My Pal Trigger (1946) online here. 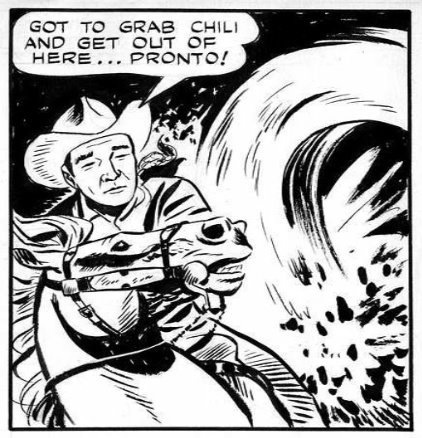 More Roy Rogers “Excitement-Jammed Western Entertainment” is on the way from the Hermes Press book Roy Rogers: The Collected Newspaper Dailies And Sundays. It will pull from the strip’s 12-year run — black and white dailies and color Sundays — with stories and art by the likes of Mike Arens, Pete Alvardo, and Tom, Chuck, and Bob McKimson — oh, and Alex Toth (it’ll include everything he did on the title). The book will also boast a history of the strip, artwork, ads, toys, etc. 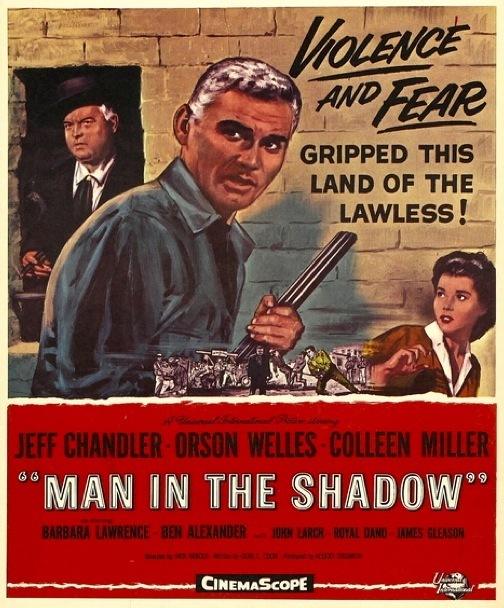 The latest installment in the Universal Vault program, offered through Amazon, includes Man In The Shadow (1957), directed by Jack Arnold in black and white CinemaScope (a favorite combination). It’s a modern-day Western starring Jeff Chandler and Orson Welles, and it’s quite good. Also available is Joel McCrea in The Virginian (1946). It’s not a 50 Western, but it’s got Joel McCrea in it. And that’s good enough for me. May 2nd seems to be the release date. Get three coffins ready — and take a little off the top. A Fistful Of Dollars (1964) was on at the barber today. A particularly interesting one is The Black Whip (1956), a Regalscope picture directed by Charles Marquis Warren. It stars Hugh Marlowe, Coleen Gray, Adele Mara, Angie Dickinson (above), Sheb Wooley and Strother Martin. Wow. But before you get your hopes up, I’ve been warned that Instant Watch is a real crap shoot as far as transfer quality and aspect ratios go. (Maybe it’s Watch as in “watch out!”) If you give ’em a shot, and they look like they’re supposed to, please let us all know through the comments. Some interesting titles are now available as part of the MGM Limited Edition Collection. 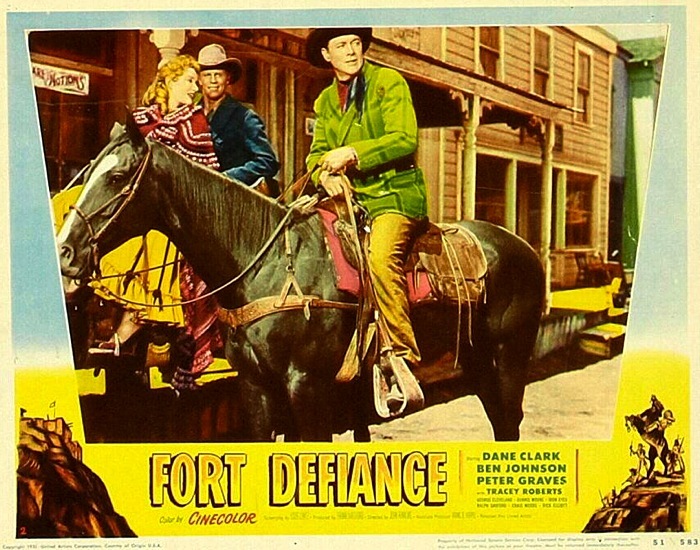 Fort Defiance (1951) stars Dane Clark, Peter Graves and Ben Johnson. Directed by John Rawlins, it‘s in Cinecolor. 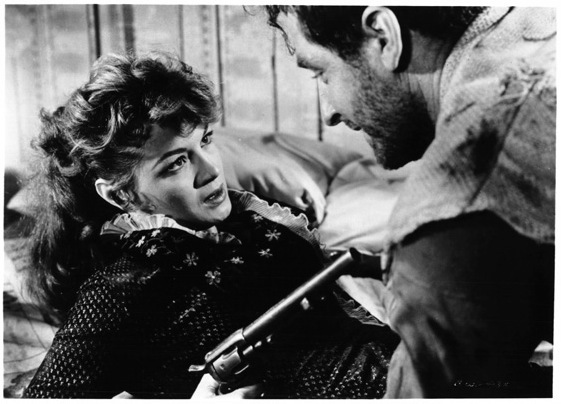 Johnson’s got the lead in Fort Bowie (1958), directed by Howard W. Koch. Koch is primarily known as a producer — everything from Pharaoh’s Curse (1957) to Airplane! (1980). But he directed the terrific crime/prison picture Big House U.S.A. (1955) and some episodes of The Untouchables, among other things. Davey Crockett, Indian Scout (1950) stars George Montgomery, Ellen Drew and Noah Beery Jr. It was directed by Lew Landers (real name: Louis Friedlander), a prolific and often quite good director whose credits include everything from The Raven (1935) to Hot Rod Gang (1958). What’s more, there’s The Gun Runners (1958), a non-Western picture that reunites Audie Murphy and Don Siegel. Gene Autry sings “Peter Cottontail” in Hills Of Utah (1951). You can hear a bit of it in this trailer. Released by Columbia, it was directed by John English in Lone Pine. Grauman’s Chinese Theatre, Hollywood, CA.